Curves are new buzzword in the electronics world! A few weeks after rival Samsung launched a smartphone with curved display screen, its Korean compatriot has now gone one step further – innovating both the television and the smartphone! LG, one of the world leaders in white goods, is trying hard to reclaim its position among the top in televisions and smartphones. LG G2, which had lots of hopes pinned on it, couldn’t do well as per LG standards. Now, it has gone all guns blazing to rock the television and smartphone industry. Setting a new milestone in the evolution of the smart screen, LG proudly announced the India arrival of the world’s first stunning range of curved products – world’s first LG curved OLED TV, the 55EA9800 and LG G Flex, the world’s first curved flexing smartphone. What’s new in the TV? The industry’s very first curved screen LG 55″ Curved OLED (organic light-emitting diode) TV features a path breaking ergonomic design with full CINEMA 3D support, cinematic experience and proprietary WRGB (White Red Green Blue color filter) technology. The incredibly thin display has a gentle inward flex design, removing the problem of screen-edge visual distortion and detail loss. LG’s groundbreaking Curved OLED TV (55EA9800) features unique 4k-color pixel technology, a staggeringly thin display (just 4.3mm), a dramatic curved design and a vivid picture quality. Another highlight of this curved OLED TV is its Magic Remote, which has features like Gesture, Pointing, Wheel, Voice, and Universal Control; which is the most convenient and advanced TV remote. 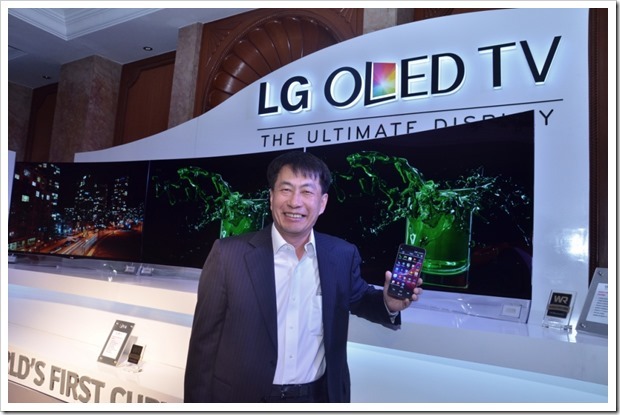 The LG Curved OLED 55EA9800 will be available for Rs. 9,99,000 which is not a high amount considering TV makers are launching TVs for as high as 2.5 million rupees. The G Flex incorporates proprietary innovations from other LG companies in the form of the display and battery such as LG Display and LG Chem. The LG G Flex has captivated early adopters every-where as the first smartphone curved to follow the contour of the human face, made possible with the implementation of the world’s first curved smartphone battery. One of the biggest advantages of vertically curved design of the LG G Flex is that it reduces the distance between one’s mouth to the microphone when the device is held against the ear, as traditional telephone handsets used to. The LG G Flex employs a curvature arc that is optimized for the average face, to deliver improved voice and sound quality. The curved form increases the sound level compared to typical flat smartphones. Also, in landscape mode, the display offers a cinematic experience, with the result being the most comfortable viewing angle for watching videos or playing games. LG G Flex also features the Rear Key first introduced in the LG G2. The 6-inch display found in the G Flex is the world’s largest Plastic OLED (POLED) display developed and mass produced specifically for smartphones. The ultra-thin, ultra-light POLED display is brighter and more precise due to the application of Real RGB, which contains all three sub-pixels — red, green and blue — in one pixel. This Android Jelly Bean Phone is powered by a Qualcomm Snapdragon quad-core processor. While the screen is HD, the phone supports Full HD capture. The rear camera is 13 MP. “Self-Healing” coating on the back cover – the elastic coating has the ability to recover from the daily wear-and-tear scratches and nicks that uncased smartphones are likely to receive, keeping the G Flex looking newer longer. LG G Flex will be available in India in February 2014. 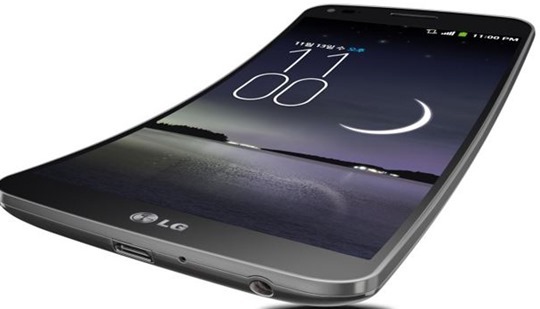 I am not sure how a curved phone is an innovation in the smartphone industry or how exactly it is good in day-to-day use. LG may be able to make a dent in the television market by this launch but it needs to have its pricing in place for a foothold in the ever-evolving, cut-throat market of smartphone. #GOSF Vs #OMGSale: Case Of Quantity Versus Quality?